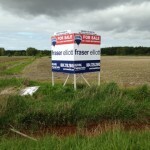 We drive past commercial real estate signs every day. Whether it be Form Retail, HQ Commercial, or Lee & Associates, the choice material for the majority of commercial real estate signs is Coroplast. 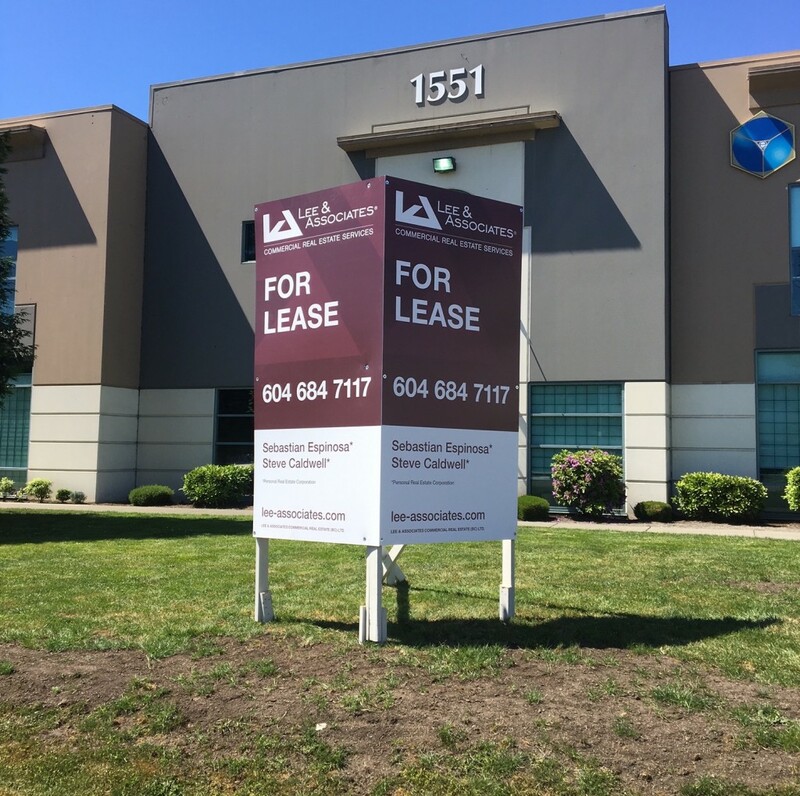 Coroplast is light in weight, cost-effective, and durable plastic that is ideal when you require large format signs for the sale or lease of properties. Coroplast is meant for outdoor use and can easily stand up to the local weather conditions for British Columbia. Our skilled graphic designers work with many commercial real estate companies and property management companies. 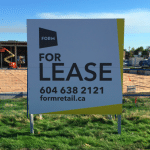 Commercial real estate signs typically include: company logos and branding, information on the property that is being sold or leased, and contact information. Simple Sign has templates for many different real estate companies, so we can easily add information and send our customers a design proof before proceeding to print. 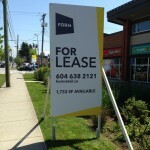 Typical dimensions for Commercial real estate signs include 4′ x 8′, 4′ x 6′, and 4′ x 4′. It is also common to use a v-signs and double-sided signs to maximize your advertising exposure for traffic travelling in different directions. Please see an example of a v-sign in the sign photos section below. 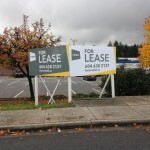 Why use Coroplast for Commercial Real Estate Signs? 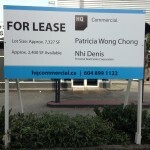 The main reason Coroplast is used for commercial real estate signs is the material is very cost-effective. 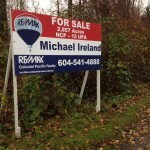 A realtor can order a 4′ x 8′ Coroplast Sign at a reasonable price and the sign is large enough to be easily noticed by passing traffic and pedestrians. 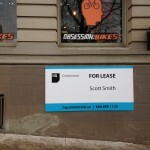 Additionally, The installation for a 4′ x 8′ Coroplast sign only requires one sign installer. This helps to cut down on the labour required to have the signs installed, resulting in further cost-savings. Beyond the cost-savings of using Coroplast for commercial real estate signs, the materials used for the Coroplast sign installations can easily be reused and recycled. 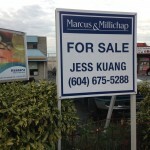 Simple Sign includes a free/optional sign removal service for local sign orders. This saves our customers the effort of disposing of their signs once they are no longer required. Also, this will help to keep our signs out of landfills and reduce our company’s impact on the environment.